A trusted woman in my life told me that the other day. (And by trusted woman I mean my counselor whose qualifications for saying such a thing to me are found in the string of abbreviations that represent her many professional degrees in these matters!) I cringed, but couldn’t exactly protest. I was asking all these questions of her, looking for wisdom and counsel and frankly, some answers! What I got instead was, “You have a theology problem. You need to go work that out!” Not what I was looking for. In fact, I’m quite certain I left the conversation with more problems than what came in the door with me! It seems that what I believe to be true for you, friend, is not what I actually believe to be true for me. I carry around two different theologies. One for you and another for me. Can you relate? I believe that God is good and beautiful. I believe that you are loved and worthy of love simply because you exist. I believe that God is first and foremost a Father; a perfect, loving Dad who desperately wants good things for you. I believe that the kindness of the Lord is the only thing that leads to repentance. I believe that you are free. I believe that for you. I do not believe that for me. I “know”rationally that these truths apply to me. As it turns out, the problem is that I, along with the rest of the human population, am made up of more than just reason and logic. (I know, I know- it was surprising for me to learn, too!) So things start to really break down for me when I’m challenged to push beyond what I know and consider what it is that I truly believe. It’s a full on meltdown for me then when what I think in my head contradicts what I believe in my heart (or spirit or gut- let’s be honest, those are pretty tough to distinguish between). Apparently I am not a fan of said meltdowns (can you blame me?!) so I’ve just learned to avoid them largely by ignoring my heart. Things are tidier and more stable for everyone that way. At least that’s what I tell myself. People are sophisticated and strong creatures– we can hold a massive amount of tension for a while. We can subdivide ourselves. (Some of us can do that more efficiently than others.) We can decide what parts of us have a higher moral value, what parts of us are more socially acceptable, what pieces are “stronger” or more important or appealing about us. For me, those rational and reasonable parts are what I offer to the world, the parts I invest in and care for and like the best about myself. All the other pieces in there I’ve labeled as weak, intemperate, fickle, and untrustworthy. What I have been learning the slow, long, hard way is that God made us to be whole. He made all the parts and all the parts are needed to make me whole. There are no spare or inconsequential parts in me. There are no spare or inconsequential parts in you. 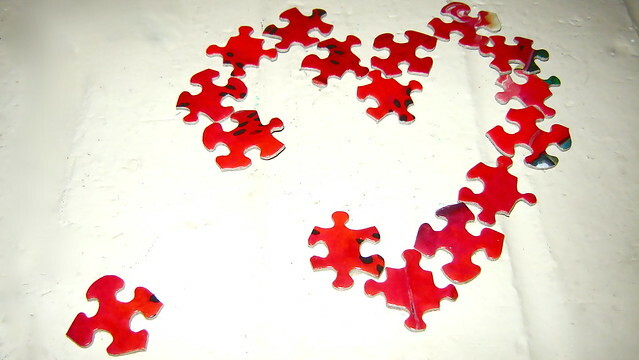 The painstaking process of reconciling my “theology problem” involves me being willing to hold onto all the puzzle pieces; not throwing out or dismissing half of them just because I can’t figure out where they fit right now. It looks like carving out space in an already impossibly full day to dig deep; to find a way to name the hard things; to gently call out the fragile things hidden away. It means confessing my unbelief to the Lord over and over and over again. It requires me writing with ink on paper what’s in my heart. Sometimes it helps to think of someone I love and what I would say to them if the unbeliefs I hold were coming out of their mouth and not mine. What would I want them to know? How would I pray? How could I bless them and deposit tender truths in their heart? This means I cannot fix my little “theology problem” alone. It becomes a group project, a team sport. The Lord mercifully recruited bringers of the message of salvation for me. He gives me a trustworthy counselor, who I affectionately refer to as my very own black hole. Let me tell you that there is something holy about saying whatever you need to say to someone who is trained to suspend judgement and who is bound by law to keep your confidence. She’s an amazing bringer. Then there are the handful of friends and family who still manage to take my calls and want to spend time with me, even though it must feel like watching a dog chase its tail for hours on end to listen to me process all of this. Lastly, I know deep down that banishing my unbelief will mean taking some hard and scary steps in my “everyday, ordinary life—my sleeping, eating, going-to-work, and walking-around life” as Eugene Peterson puts it. Honestly, I don’t know what all those will be yet. I imagine many of them will be small and awkward- the kinds of things you think surely wouldn’t be so insignificant if they were really from God, but so hard to talk yourself into doing that they must be from God. You know what I’m talking about, don’t you?! There will be big steps, too, I’m sure- “Peter steps” is what I’ll call those. Because while I know it was by faith that Peter believed and earnestly wanted Jesus to call him out of the boat, the miracle we all talk about is the guy actually walking on the water, not simply him wanting to do so from inside the boat. I guess the best way to say it is that I don’t know how much you can believe, or how much unbelief you can exorcise, from inside the boat. That’s the terrifying truth. It’s terrifying though in the way that really trusting God is always terrifying…and life-changing. Knowing just isn’t enough for me anymore. It isn’t all that I need, it isn’t all that I am inside. I need to believe, in every sense of the word, that Jesus is for and with me in all the ways that I deeply believe that he is for and with you. I need to be free from the weight of lugging around two different theologies everywhere I go. I just need one really good one in which Jesus is more than enough for every part of each and every one of us.